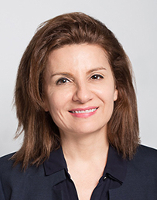 Marjan Riggi is a Senior Managing Director who leads the Corporate Aviation and Specialty Finance teams at Kroll Bond Rating Agency. She has over 20 years of multi-sector expertise in credit analysis of banks and specialty finance, as well as securitizations. Marjan initiated ratings of aircraft lessors at KBRA in early 2013 and has since been responsible for the development of the analytical framework and the ratings of aircraft lessors and airlines including EETCs and other secured aviation financings. Prior to joining KBRA, Riggi was a Senior Credit Officer at Moody's with senior lead responsibility for banks and diversified financials (finance companies, private equity firms, stock exchanges, and other securities firms). Before covering financials, Marjan was a lead analyst in Structured Finance at Moody's where she covered ABS and RMBS as well as ratings criteria development. She began her career as a Banking Analyst at the Federal Reserve Bank of New York. Marjan has a Masters in International Affairs and Finance from Columbia University in NY and a BA in Linguistics from the University of Kansas.